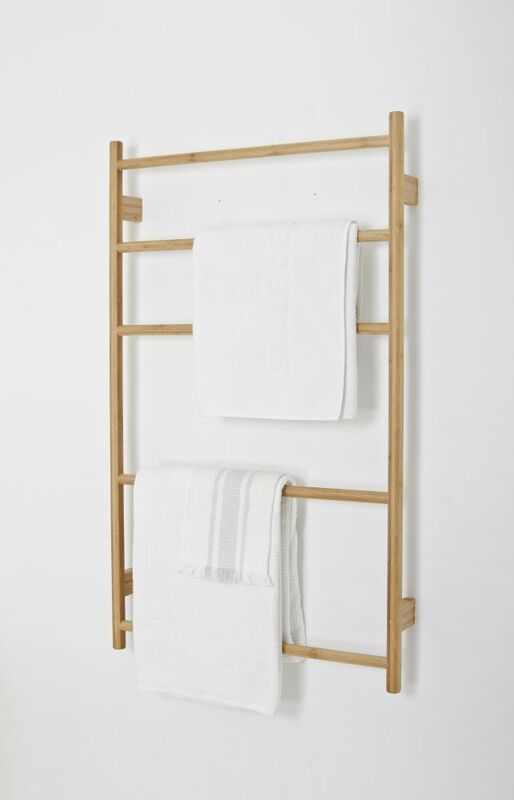 Make better use of the space you have with 'Wallbar' five rail towel ladder. Less fiddly triple folding - Wallbar is wide enough to fit a bath sheet easily. Round rails make it easier to put towels on and take them off, no edges to snag or catch. Rails are stepped off the wall making room for thicker towels and allowing the air to circulate better, drying them more quickly. Staggered spacing uses the space more efficiently. Smaller hand towels and full size bath towels can both be stored together. Concealed fixings mean there are no screws visible. Made from sustainably harvested solid American white oak, finished in a smooth, matt, water resistant lacquer. Edges look crisp but are finely hand sanded to make them soft to the touch. Design by Lincoln Rivers. Dark oak variant: Made from sustainably harvested, solid American white oak, and oak veneers, finished with a matt, dark stain water resistant lacquer. Oyster white variant: Made from sustainably harvested solid American white oak, finished in a smooth, matt, white tint water resistant lacquer.